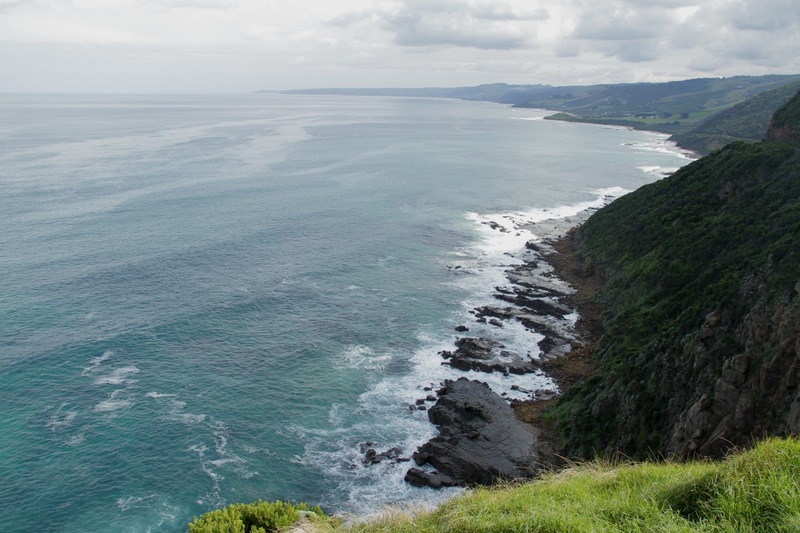 The Great Ocean Road in Victoria, Australia winds along nearly 250 kilometers of spectacular coastline, looking remarkably similar to California’s Big Sur. It’s an easy drive from Melbourne, and we elected to rent a car and get out of the city for a few days while our newly purchased car was tuned up. 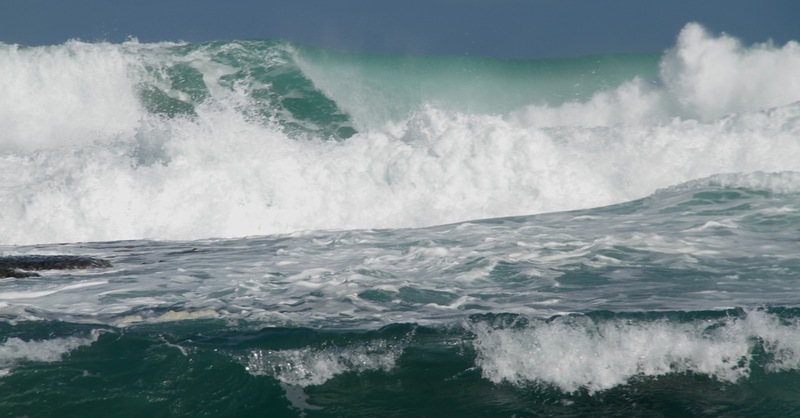 From the unfamiliar left side of the road, we watched the ocean crash against yellow cliffs and long, cold beaches. Sometimes the road hugs the cliff sides, and other times it veers inland to pass under koalas perched in roadside eucalyptus trees or next to pastures dotted with dairy cows. Frequent turnoffs and trails down to the water provide enough diversions to fill a whole day alternately driving and hopping out of the car to explore. It was quite a nice way to take in the scenery, and a refreshing freedom after the restraints of public transport in Southeast Asia. 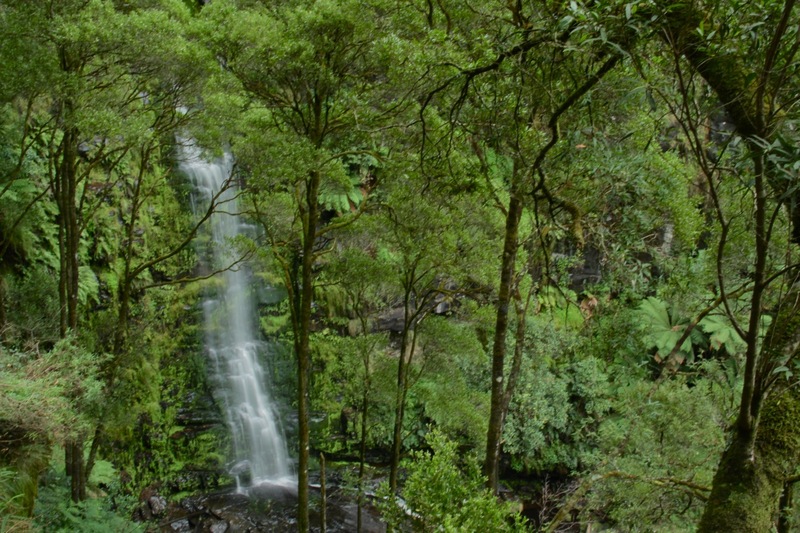 Erskine Falls, a short drive inland from the Great Ocean Road. 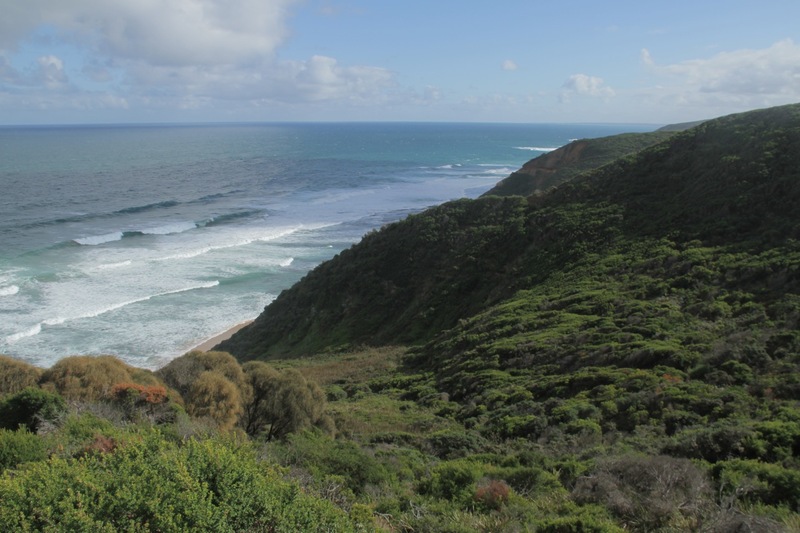 The coast reaches its southernmost point at Cape Otway, and from there eastward it becomes even more rugged. 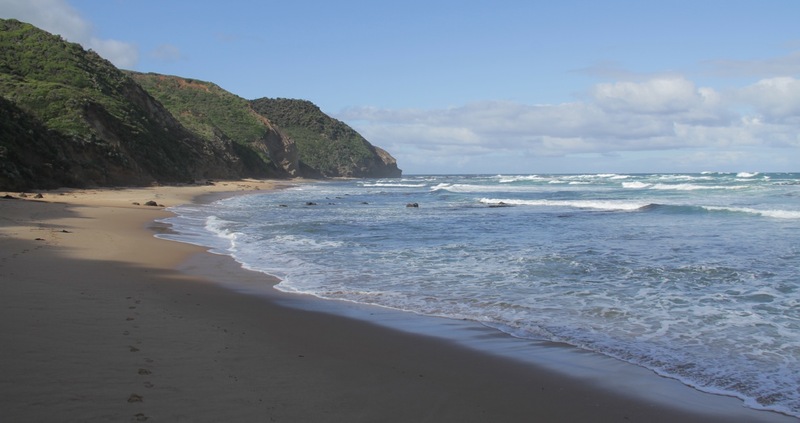 For the next 120 kilometers, it is known as the Shipwreck Coast— over 80 ships sunk off the unforgiving shoreline in 40 years during the 1800s. We walked down to Wreck Beach, where two rusted anchors are visible at low tide. 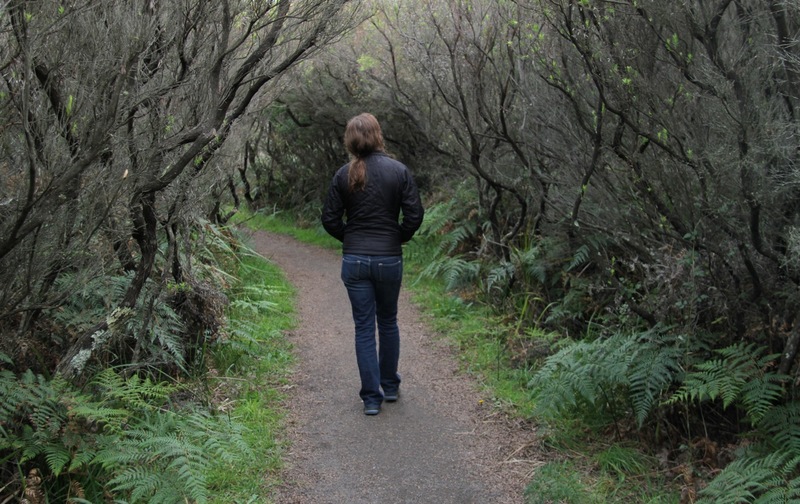 After snaking through low bushes and wild-looking, twisted trees that seem to have jumped out of a Van Gogh painting, the trail broke out into open, wind-swept headland before plunging down steps to the beach. From here, it’s easy to see why the coast is so treacherous. 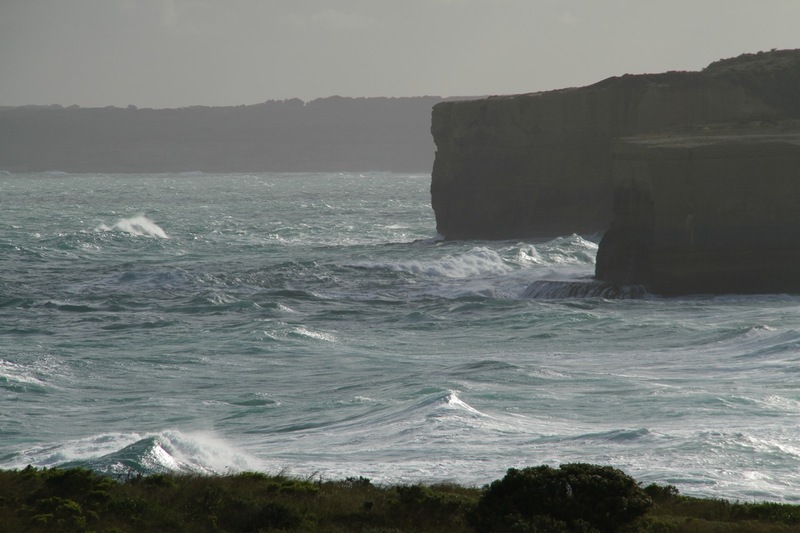 The angry Southern Ocean was stacked high with frothy waves, which were thrown ashore at jagged cliffs, creating the sound of a roaring jet engine. 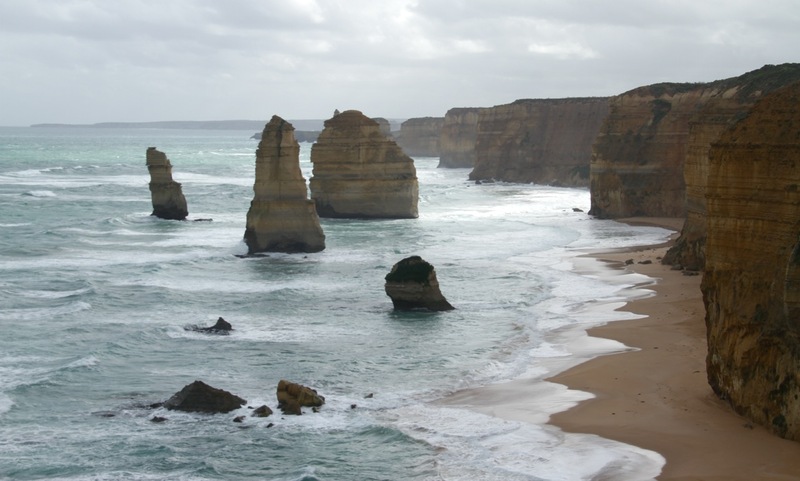 By far the most popular section of the road is the Twelve Apostles, a group of sandstone pillars standing in the spraying surf. They were beautiful, the yellow and orange sandstone contrasting with the deep blue waves crashing around them. But, despite the cold weather, the walkways were full of people jostling for the best photo spots, and we preferred some of the more isolated beaches and viewpoints. Knowing that Antarctica is the next piece of land past the distant whitecapped horizon makes it feel like the edge of the world. 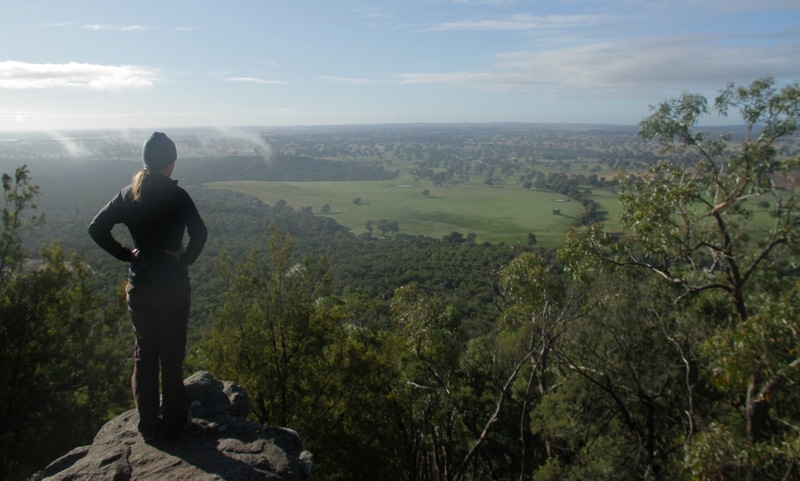 Once we’d gotten our fill of the ocean, we turned north to Grampians National Park, home to a mountain range of the same name. 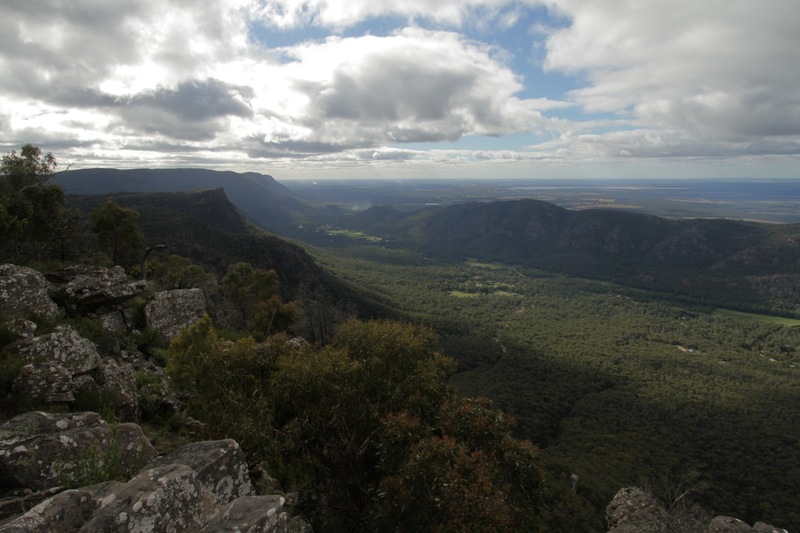 Small by anyone’s standards, the Grampians make up for their stature with sheer cliffs on the eastern side which offer a long-reaching view of the incredibly flat landscape beyond. Much of this part of Victoria reminded us of the familiar. The Great Ocean Road could easily have been California, while the drive north to the mountains passed through landscapes with shades of Iowa, Nebraska, and then Arizona. But a closer look reveals an alien world. 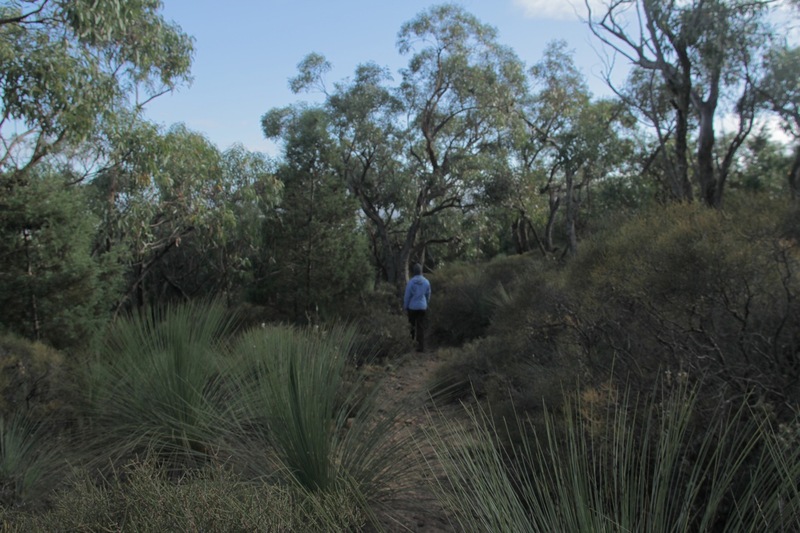 The vegetation is entirely foreign— forests filled with plants we have never seen— and rounding a bend in the trail put us face to face with kangaroos on several occasions. Cockatoos, parrots, and kookaburras screech from the treetops, and we’re awoken each morning by strange, jarring birdsongs. 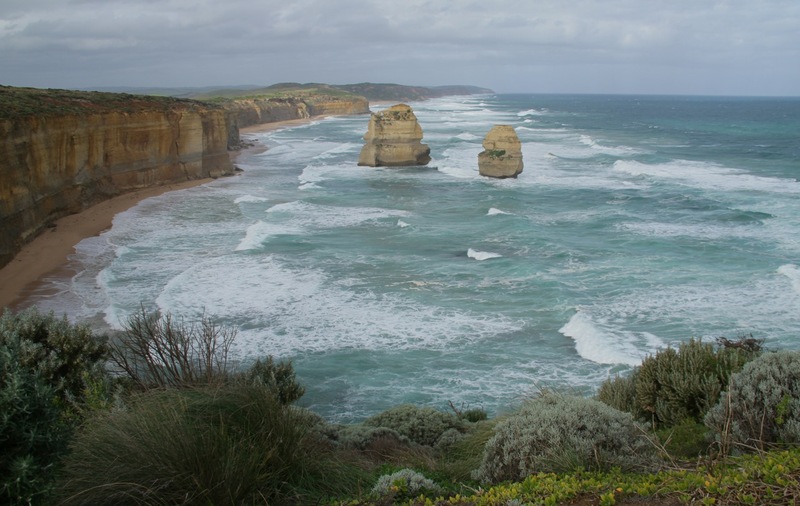 Before long, it was time for our introductory exploration to come to an end, and we were due back in Melbourne to exchange our rental car for the one we purchased— a 1996 Ford Falcon station wagon. It’s not glamorous, but is in very good shape for its age. Plus, it comes with a buyback guarantee, which gives the piece of mind that we can recoup at least some of the purchase price when we are ready to leave. We were also delighted to discover that Travelers Autobarn loans out camping gear with their cars (chairs, stove, kitchen supplies), and ours also included a plush foam mattress, which barely squeezes into our tent. From here, our planned route takes us through some of the highlights of Victoria and New South Wales before we head north for warmth. So far cool rain and clouds have been obnoxiously consistent travel companions, and it gets bitterly cold at 4 a.m. in a tent. Why camping in late fall, you ask? Ski vacations in Japan, dive certifications, and four-star cruises do wonders to drain a travel budget, and we have drawn up a plan for Australia accordingly. We have allotted for only a week’s worth of hostel/motel stays, splitting the rest of the 11 weeks between backcountry backpacking trips, car camping, and putting our Working Holiday Visas to good use by harvesting fruit (more on this soon). It is a very exciting feeling to be dropped at the edge of a large, wild, unfamiliar continent and given three months to explore. Our first travels together were on the road around the western U.S. in a car that looks vaguely similar to our new (used) maroon Ford Falcon. Road trips are something we are good at. Very good at. And the prospect of driving 8,000 miles around Australia is grand. This entry was posted on May 14, 2011 by Five Eyes Films. It was filed under Uncategorized and was tagged with australia, mountains, oceans, road trip. You are making me want to go back to Australia so bad!!!!! Brisbane was my favorite stop by far so enjoy that one!! love you! Wonderful! Looks amazing! I’m so excited to see Australia with you and your 5th eye! xo!